Founded in 1649 and the capital of the U.S. at the end of the Revolutionary War, Annapolis, Maryland, has been the state capital since 1694 and is the oldest continuously used capital city in the U.S. It is located 25 mi/40 km south of Baltimore. 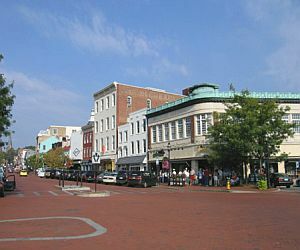 Annapolis is a scenic town of trim colonial buildings along tree-lined brick streets. Quaint shops and restaurants draw strollers to the well-preserved downtown historic area, built mostly in the mid-1700s, and to the waterfront, where the long line of sailboats verifies the town's reputation as the "sailing capital of the U.S."
We suggest that you consider at least a two-night stay, starting with visits to the Government House, the governor's home; Hammond-Harwood House, a Georgian-style mansion from the 1700s; and the Maryland State House—built in 1772, it features the oldest statehouse in continuous legislative use in the U.S. and the largest wooden dome in the country. Other vintage-building highlights include the Chase-Lloyd House, with its unique cantilevered stairway; the William Paca House and Garden, the circa-1700s estate of the Maryland governor who signed the Declaration of Independence—the restoration of the garden was a particularly impressive feat; and the London Town House and Gardens in nearby Edgewater. Annapolis is perhaps best-known for the U.S. Naval Academy. A tour of the campus takes in Bancroft Hall, one of the world's largest dormitories; the chapel, where you'll find beautiful Tiffany windows and the crypt of legendary naval hero John Paul Jones; and the Tecumseh figurehead, a source of Annapolis tradition for generations. Try to be there at noon during school sessions to see the midshipmen march in formation. If you're there in July, you absolutely must witness Induction Day at the academy, when freshmen are sworn in. The Naval Academy isn't the only institution of higher learning in Annapolis. St. John's College, a literary school of some 400 students, is the other campus in town. The "Mids" (Naval Midshipmen) and the "Johnnies" engage in a spirited croquet match each April. Three more sights worth a stop: the Helen Avalynne Tawes Garden, a 6-acre/2.5-hectare botanical garden; the Banneker-Douglass Museum, which has changing exhibits dedicated to preserving Maryland's African American heritage; and the plaque at Annapolis Harbor dedicated to Kunta Kinte, a slave and character in Alex Haley's novel Roots. Though you can see most of Annapolis' attractions on your own, walking, bus and boat tours are available. The city's narrow streets can get congested, and parking often seems impossible. Our recommendation is to walk: You'll get a better feel for this "museum without walls" while on foot. Annapolis is an excellent place for food. Try lunch at Chick and Ruth's, an old-fashioned deli that's a favorite hangout of legislators. Walls showcase pictures that chronicle the local heroes who have been regulars. Or try some of America's best seafood, especially during the Maryland Seafood Festival at Sandy Point State Park in September. The Candlelight Pub Crawl, in December, is a candlelit walk through the historic district, with a progressive seasonal feast. And on New Year's Eve, the city holds its "First Night Annapolis" celebration, which entertains with arts, theater, singing and fireworks. Anglers might want to try catching their dinner in the nearby Chesapeake Bay, where the fishing is fine. Bay cruises and beach time are other possibilities.